Pin It Now! Mark's Pawpaw and Grandma arrived safely all the way from Memphis on Thursday, May 21 around 3:00 in the afternoon. 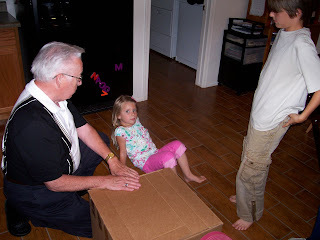 And there was a big, brown box in the back of their minivan that couldn't be opened until after Daddy got home. Torture for the kids for sure. 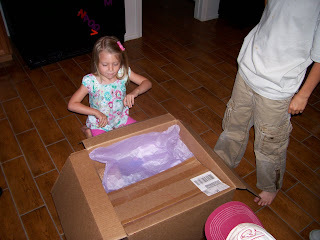 Immediately after dinner, before Daddy had to scoot on out the door again (this time for band practice), Shiloh was the one who got to open it. Pawpaw and Grandma explained that it was an early birthday present. 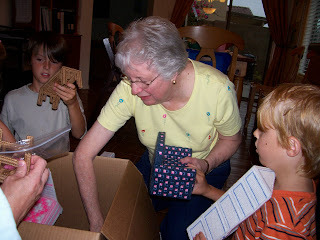 Wow, I was totally unprepared for what was in that box!!! 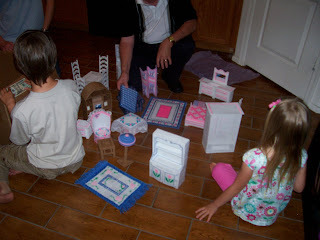 Tons of Barbie furniture hand made by Grandma, which is Shiloh's GREAT Grandma. Such a treasure. A dining set, living room set and a bedroom set--I believe 24 pieces in all. A lot of work and love went into this gift! At the very bottom of the box was a little something for Mullin and Lincoln, too--green paper with numbers. And of course it was spent the very next day on Star Wars stuff! Shiloh loved it. 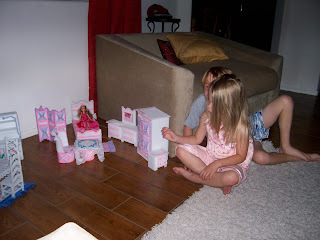 Mullin helped her set the furniture up while she brought her Barbies downstairs. A perfect gift for Shiloh who is getting very into Barbies right now! !